Dwayne Worrell from SOL CARIBBEAN LTD. and Karoline Smith at the Career Showcase held at the UWI Mona Campus. 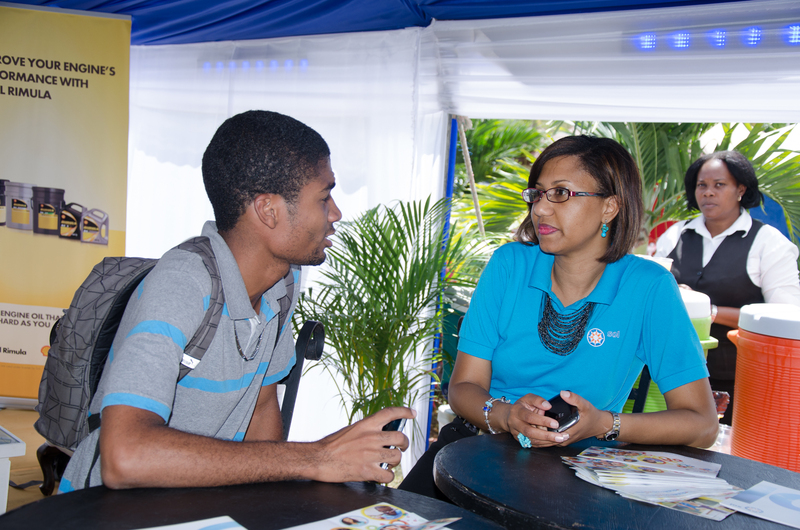 UWI students watching a presentation under the Sol tent at the Career Showcase on the UWI Mona Campus. The Sol team with Sol Scholarship recipient Dexter Dean Colquhoun (second from left). 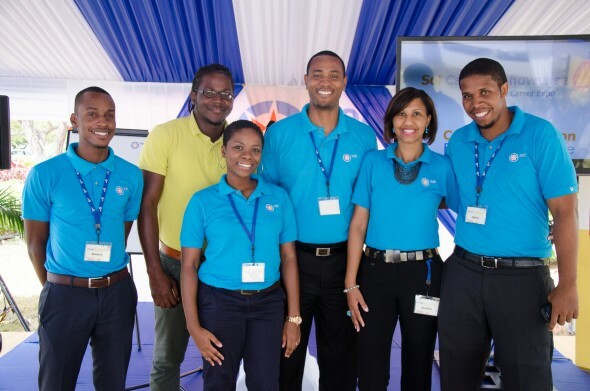 Sol’s reputation as a leading regional company for Caribbean students seeking internships or pursuing highly fulfilling careers has been enhanced following the Sol Careers Showcase recently held within the Annual Career Exposition of the Mona Campus of the University of the West Indies (UWI). The highly interactive and digitally presented Showcase which engaged hundreds of keen students over three days received very positive reviews from students who praised it as thought-provoking, enlightening and informative. A team of Sol employees from across the company came together to engage with students visiting the showcase held as part of Sol’s overall educational mandate for reaching out to assist university students across the region. The Careers Showcase has been identified as an effective strategy for reaching student audiences and the results have been pleasing so far. By all reports, the Mona Showcase has indeed been enlightening both for students and company representatives who saw it as an opportunity to share their perspective on the vision and goals of the company and what it meant to be a Sol employee. Employees were able to share information on Sol and how the company does business, while students were very interested in hearing about the Sol Scholarship programme, CSR initiatives and internships and careers at Sol. The event was successful in delighting the university students, not only so that they would want to work at Sol, but also in inspiring them to be the best that they can wherever they might go. Another positive feature was the varied representation from the company with a team that included previous Sol scholarship winners and former interns who were able to share first-hand experiences with students visiting the Showcase tent. Students would also have appreciated the digital nature of the Sol Showcase which utilised short stimulating video clips for the majority of its presentations. The sessions were also very interactive and provided several informative takeaway items and that were yet another incentive for students to visit. Sol also adopted an organised approach to the Showcase scheduling presentations at specific times, so that students could plan their visits. Topics included how to dress appropriately for the workplace and what qualities employers look for in an employee. The Sol team was very engaging in and around the tent area, and students were generally very impressed with the entire effort, some even remarking that it looked like the VIP area of the entire Careers Expo.